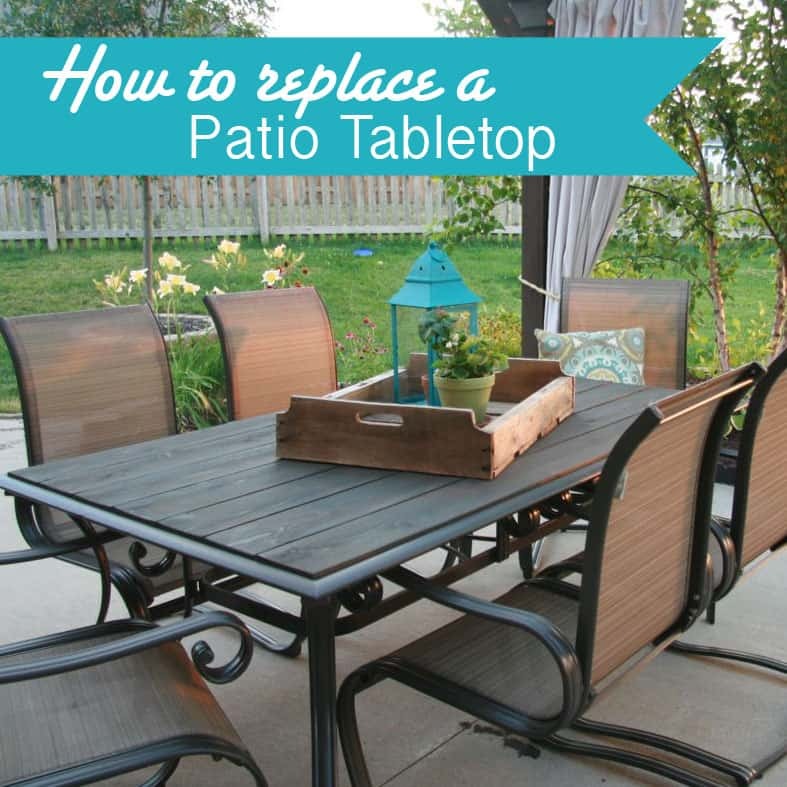 Earlier this week I revealed our Outdoor Patio Makeover. 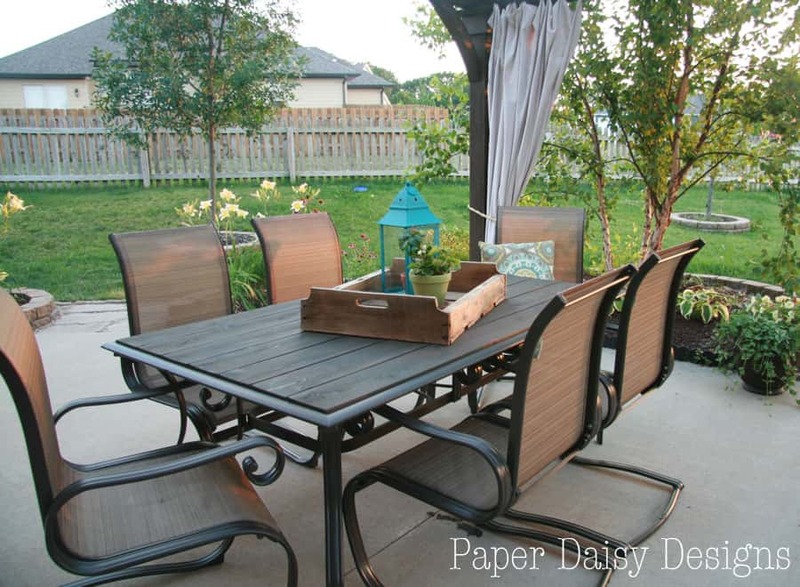 One of the integral pieces that needed a major overhaul was our large outdoor dinning table and chairs. It’s a spacious table we have had for nearly ten years. Initially, the tabletop was glass. Of course, you can imagine how long that lasted when we forgot to fold up the large matching umbrella. To replace the glass, we visited a local glass shop and ordered a piece of plexiglass. That held up fairly well for a few years, but the extreme weather of the Midwest eventually made it buckle and warp. Other than the tabletop situation, the patio set was still in decent condition and we have always enjoyed how the chairs gently rock. 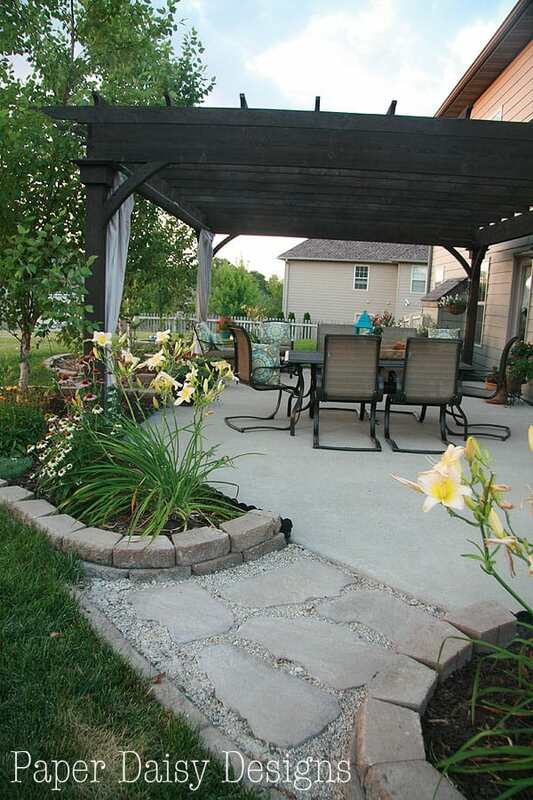 And have you looked at the price of patio furniture recently? Yikes! Replacing the entire set was not an option. I must admit I wracked my brain for the last couple years to come up with a workable replacement for the tabletop. 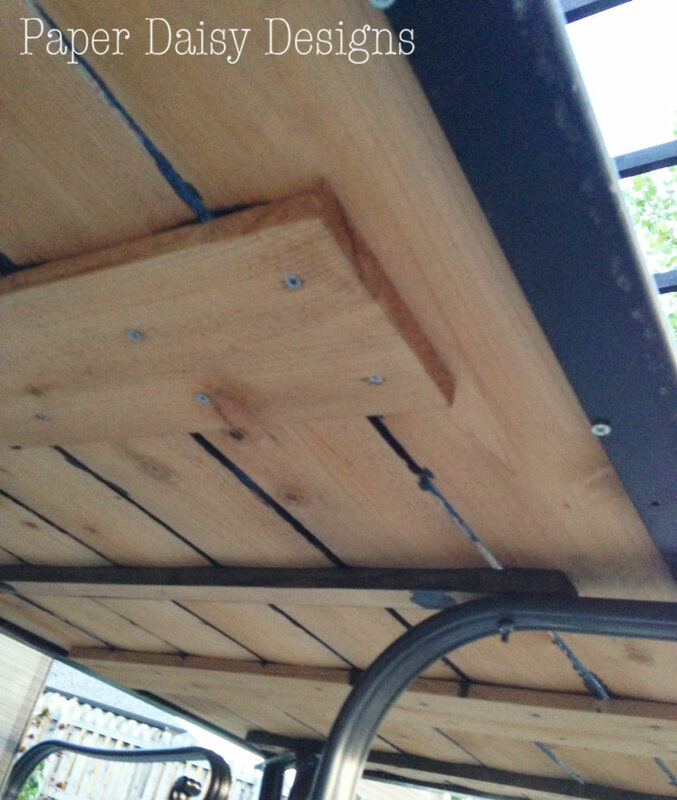 Sometime this spring I settled on the idea of placing cedar fence boards in the recesses created for the glass to sit in as an inexpensive option. It was a pretty easy thing to do. We trimmed the top of the boards off to the exact size of the plexiglass and dropped them into the table. It took seven 1×6 boards to fill the width of the table. To achieve even spacing between the boards I used scraps of cardboard and then my husband screwed a support board from underneath to hold the boards in place. We also added a small strip of wood that sits on the table base in the center for extra support. Once everything was nice and secure, I sanded the top smooth and then stained the boards with a semi transparent deck stain, Burnt Hickory by Cabots. I’d never stained a deck before and was surprised how quickly the stain soaked into the wood. Once it was dry, we had a beautiful tabletop with a slightly rustic flair. To refresh the chairs, after a good cleaning, I painted them with latex enamel paint in a satin finish from Sherwin Williams. 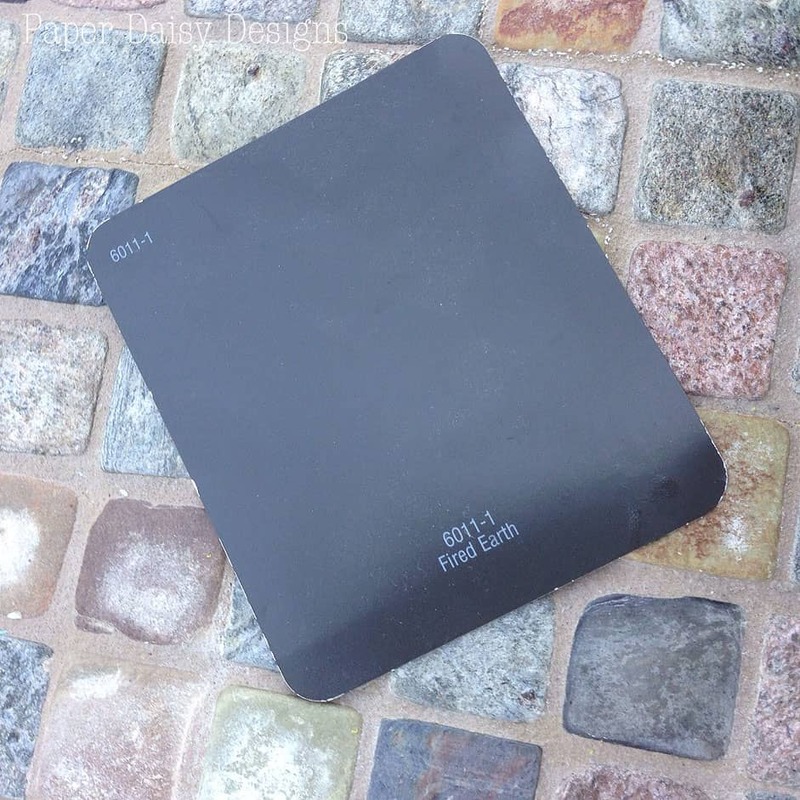 The color, Fired Earth, was fairly unique choice from Valspar. I discovered this when I forgot to bring the sample with me on my first trip to the paint store. Much to my surprise, there wasn’t anything even remotely similar on any paint deck at Sherwin Williams or any other for that matter. Fired Earth is a rich black brown and is very much the same tone and color of the original finish of the table and chair bases. I found that a super smooth, cabinet sponge roller was the best way to apply the paint and avoid brush strokes.Obviously, spraying would have worked as well, but I needed to avoid over spaying the outdoor fabric on the chairs and have a hard time stomach the waste created with spraying. One last thing to note, I’m not sure if you noticed we decided to leave off the hole for an umbrella. Generally we use the table in the evening. The umbrella we had was useless for the setting sun. I also like the idea of being able to easily throw on a tablecloth. 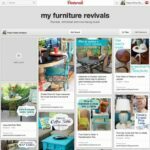 UPDATE: Since this has continued to be a very popular post on Pinterest, I thought I’d share a follow-up. 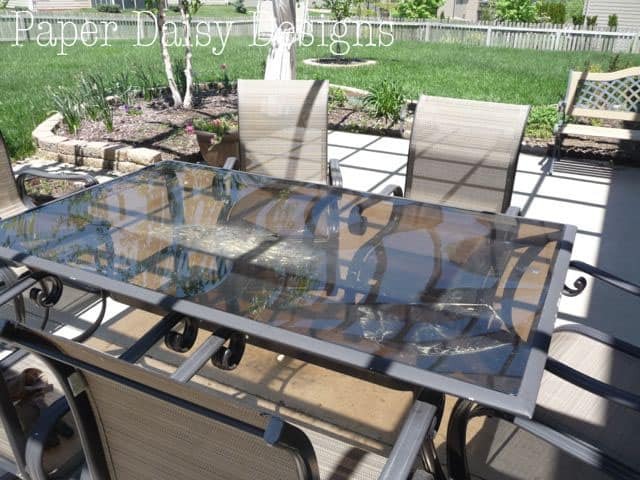 I had to sell this table because it didn’t fit on our patio once we moved. We purchased a small round table, but after we built an outdoor banquette, we realized we really needed a rectangular table. SO I built a new one! Check it out here. Thanks for sharing! Looks wonderful! And your pup is adorable! 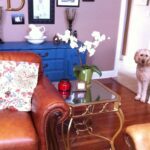 Great project, do you remember what kind of paint you used on the dining seats and backs? They look darker than original photo. 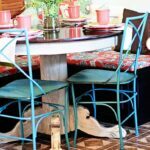 But yes, I did paint the metal parts of chairs and table a color called Fired Clay from Valspar. Hi, I lovedloved your project and we had unfortunately the same problem with our glass table top. One question? What did you used to paste o got the wood boards to stay together? Thanks, we are thinking in building ours this coming weekend. 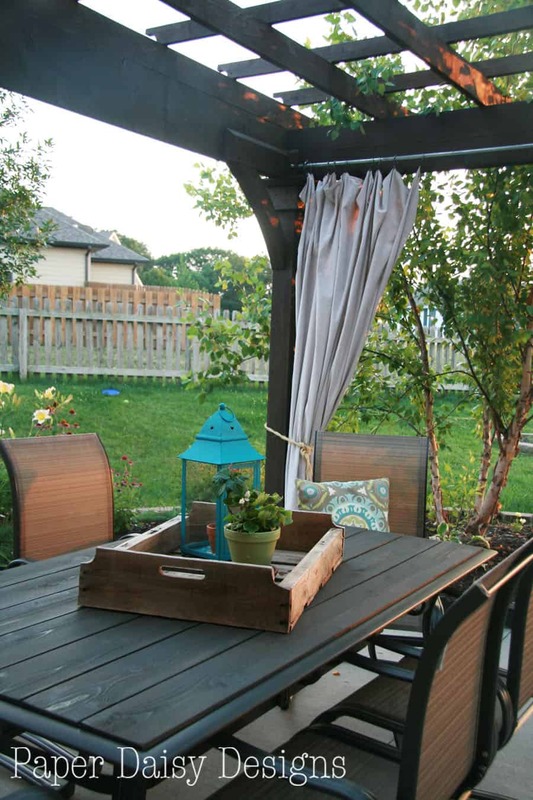 How did you match the thickness of the fence boards to that of the space in the table where the glass sat originally? The wood did sit a little higher than the outside frame of the table, but nothing that bothered us or felt uncomfortable while using the table. The fence boards are not very thick. It probably depends on how your table is made. This post shows more of the photos and can give you abetter idea of how it all looked. I love your idea! 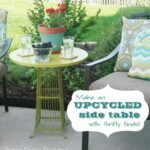 I have the exact same table frame and am going to use your design. The glass insert is warping under pressure and I worry it will crack around my kids. Do you recall how much stain you needed? Do you have any additional information about how you constructed the support boards underneath? For example, did you use the same wood – 1 x 6s – for the supports? When done was the top sturdy or did it bend with pressure? Thank you again for the great idea! 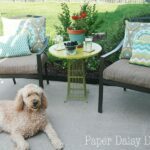 Thanks to your tutorial, I refurbished my patio set witha wood top and it looks amazing!!!! Thank you! I love the look of the table and chairs. 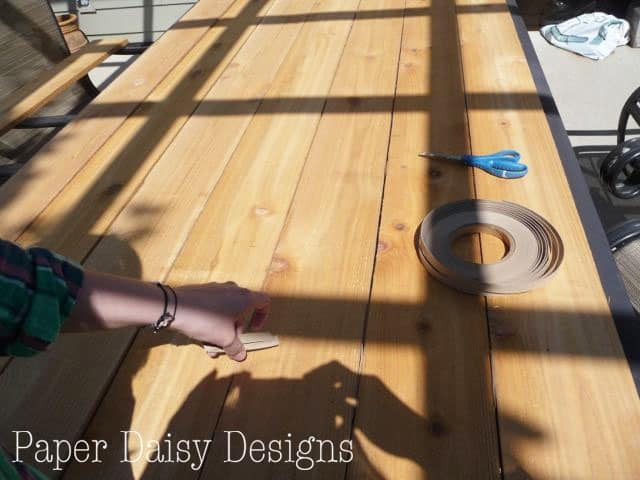 We have the exact table and have used plywood for a top for several years covered with a table cloth. Just can’t do it any more. So I”m going to try your idea. I do have a question. Did you color the chair fabric? The color looks darker. So if you did what and how did you do that? So glad you are going to give it a try! I know you will love it. I did not color the fabric. The finished photos were taken in the evening so the light was different. Atlhough, I was at a thrift store today and they had similar chairs that had been painted. I say, what do you have to loose?